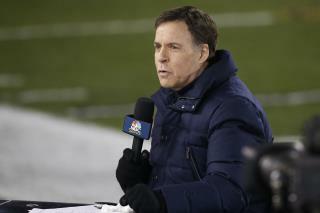 (Newser) – Bob Costas says football, at least as we know it, may soon "collapse like a house of cards" because of one "fundamental fact": "This game destroys people's brains." USA Today reports the Emmy award-winning sports broadcaster and former host of Football Night in America called the decline of the NFL as a "cash machine" the biggest story in American sports while speaking Tuesday at the University of Maryland. And Costas said that decline is not about athletes' knees but their brains. "Unless and until there is some technology which we cannot even imagine, let alone has been developed, that would make this inherently dangerous game not marginally safer, but acceptably safe, the cracks in the foundation are there," the Washington Post quotes Costas as saying. Bob, it's not brain damage, it's Marxism. What Costas is saying, regardless of how you feel about the players or the product is, that the game of Football has been proven to cause irreversible brain trauma, that will ultimately affect a players future neural status.....letting your child play is like leaving your loaded gun out on the table for them to find....that irresponsible. Bob is correct all Americans must boycott the NFL Industry!